Presented by Crafty College, Bluebonnet Crafters and Decorcal Inc. These beautiful hand painted decals come five to a package. We chose the one containing two angels. The four remaining decals have a single angel playing a musical instrument. Using one of them would make a darling gift for a music teacher or the choir director. Following the directions on the package cut out the decal you wish to use. Place it in the bowl of warm water for approximately 30 seconds. At that point the decal should slide free of the backing very easily. Place it onto the clean apothecary jar and with a paper towel smooth from the center out removing all the air bubbles, drying and straightening the decal as you go. Fill with treats of your choice. For presentation tie a pretty bow around the neck of the jar and add a tag. One of the remaining decals can be placed on card stock and used as your card. Option: A coat of water based varnish can be placed over the decal if desired. In place of edibles, hand made or purchased potpourri can be placed in the decorated jar. Any smooth sided jar can be used in place of the apothecary jar. If recycling decorate the lid. 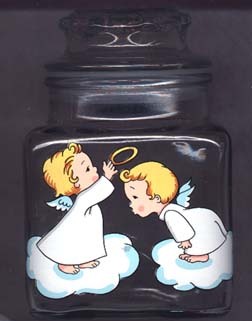 If the lid is too small one of the decals can be cut and just a portion, like the head and shoulders of the angel, can be used. Our decals are the most wanted designs. We are continually adding new designs. True water transfer decals give any surface a hand painted look. Use for home decorations and arts and crafts projects. There are two additional angel designs, many florals, fruits and vegetables, real looking and cartoon animals, patriotic designs and masculine hunting and fishing designs to name only a few. Available at your local craft supplier, if you don't see them be sure and ask for them.